This coin featuring Susan B. Anthony was first issued by the United States Mint in 1979 and it replaced the Eisenhower Dollar. This was the first time that a woman appeared on a circulating coin. The coin was minted from 1979-1981 and again in 1999. This coin was legislated on October 10, 1978 under the presidential term of Jimmy Carter. Two United States Mint Directors, Stella Hackel Sims and Donna Pope, served under President Carter’s tenure in office. 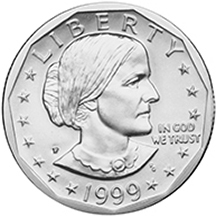 The obverse design features the likeness of Susan B. Anthony. 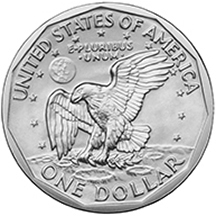 The reverse features an American eagle landing on the Moon, an adaptation of the Apollo 11 insignia.